Today we have a guest post from the fantastic company Cadremont who produce high-quality professional picture mounts for photographers and artists. Below they discuss why it is so important to use quality picture mounts in your creative business. As professional artists and photographers, we create work not only for ourselves but for others to enjoy too. For our pieces to look at their very best the work doesn’t end with the final stroke of the brush, or when the photograph finally emerges from the photo lab. In order to achieve the best results, there are other considerations that need to be taken into account and one of those things is the choice of picture mounts that we use to give our work the professional edge. My partner and I have been working in the art industry for a number of years now as I am a photographer, she’s an artist and we both recognise the importance of using high-quality materials when creating work for sale. You could be forgiven for thinking that this is merely a question of aesthetics, but it is far more than that. While a picture mount does indeed enhance the look of a piece, there are other reasons for choosing the correct type of mount too. Firstly, there is the question of longevity. For a piece of art to stand the test of time, it will need to be framed with materials that will give the piece in question the best chance of surviving. The main purpose of a mount is to create a space between the photograph, or print and the glass that will house it. Keeping the artwork away from the glass will prevent any dirt, grime or condensation that may find its way onto the inside of the frame off of your picture. Failing to keep a piece, especially photographs, away from the glass cover could result in damage to the contents. At best this could be just a surface blemish, at worst the piece could adhere itself to the glass altogether. 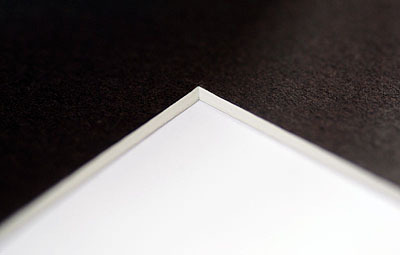 Although the purpose of the mount may seem obvious, many people neglect the necessity of choosing the correct mountboard material of which the mountboard is made is of equal importance. A good quality conservation mountboard should last for decades (many are guaranteed for 300 years) and protect your artwork for the duration of its lifespan. My partner and I now insist on only ever using 100% acid-free white core conservation mountboard on all of our pieces as it simply offers the best protection for our work. Having a mount that is totally acid-free is imperative as it prevents any staining or leaking from the board onto the artwork itself. Added to this is the fact that conservation board just looks so much better, even to the layman. It tends to sit better in the frame (a 45-degree angle helps) and, as they are generally a little thicker than standard mounts, they serve their main purpose of keeping artwork away from the glass extremely well. Even the bevels are noticeably sharper and they do not brown like so many of the cheaper alternatives available. Conservation mountboards are also compliant with the Fine Art Trade Guilds standards, which gives the buyer the peace of mind that they deserve. In short, and speaking from experience, we would not recommend anything else for mounting any piece of art that cannot be easily replaced. If you cherish your work then only the best will do, and the best is a 100% acid-free, conservation standard white core mountboard, in our opinion, our customers seem to agree as they purchase our work. We sell our artwork, mounted, with a backing board and sealed in an acetate bag to keep them clean. All the customer has to do is select a frame that suits the room it will be going in.